Several large family-type organic farmers in the Fremont, Nebraska, area have been producing lots of grain and livestock profitably without agricultural chemicals. In 1974 this eastern Nebraska sector was hit by the worst drought since the Dust Bowl days of the mid-1930s. It was turned into a government-declared disaster area by searing heat, hot winds, and weeks without rain. Only 1.6 inches of rain fell in the Fremont area in June, far short of the normal 5.75 inches, and none fell from June 11 until August 8. Temperatures shot into the 100s for days at a time during the height of the growing season and hot winds punished the crops. The local newspaper ran front-page drought stories almost daily in July and early August, reporting on disaster meetings, “burned-up” corn, nitrate poison warnings for farmers putting damaged corn in the silo, and statewide crop and livestock losses of more than $2 billion. But the crops did not fail on the 1,300 Platte River valley dryland acres farmed organically since the late 1960s by K.C. Livermore, Del and Val Akerlund, and Ray Rolfs. Livermore has corn that made 100 bushels to the acre, while Rolfs has two fields he is sure made at least 65. The Akerlunds harvested 115 acres of soybeans that averaged 45 bushels. And Rolfs’ soybeans, planted late and damaged by an early frost, still made 28 bushels. This oasis is in an area where the Department of Agriculture is making disaster payments to thousands of farmers and has estimated average per-acre yields for dryland corn at 26 bushels (compared to 75.4 last fall) and soybeans at 21 bushels (compared with 30 last fall). The results are even more significant for Livermore, Rolfs, and the Akerlunds because their farms have light, sandy soils that normally don’t hold moisture well. It is obvious that the humus buildup in the soil by organic tillage was a major factor enabling their crops to better withstand the stress of heat and drought. Word of their good crops spread throughout the region in September, and they have had a steady stream of visitors ranging from college students to bankers. Livermore says there definitely is an upsurge of interest in organic agriculture. He should know because he has averaged two visitors a day all fall, not counting those brought on tours when he wasn’t home. He takes visitors into his corn field, pulls a well-formed ear from a stalk, and breaks it in half to show the long kernels and small cob. Chemical fields in the area, he says, are producing big cobs with a few small kernels if they are producing any ears at all. He also enlists a visitor to help him pull up a stalk of corn to show the extensive root system he says is partly responsible for his excellent yields this fall. He is proud of these tangled root balls that run up to eight inches across. This was highly important because James Novotny, county extension agent in Fremont, reported late in July that subsoil moisture in the area had dropped to a depth of six feet in places, far beyond the range of most corn roots. But lack of moisture wasn’t the whole story. Del Akerlund said the drought also damaged fields in the neighborhood that were irrigated day and night during the long, dry period. Trees along irrigation ditches, he said, were scalded by the terrific heat and reflection of sun rays off the water. Akerlund said there was no insect damage at all in the fields on the three organic farms, and gives their large population of pheasants, quail, and other birds much of the credit. “On the last round when we were combining oats, there were about 200 pheasants of all sizes running ahead of the combine, and we had to stop several times to let them get out of the way,” he said. He told of taking a visitor into an irrigated chemical field of corn less than a half mile away and examining the nubby ears that had worms competing for the few rounded kernels that had formed on each cob. 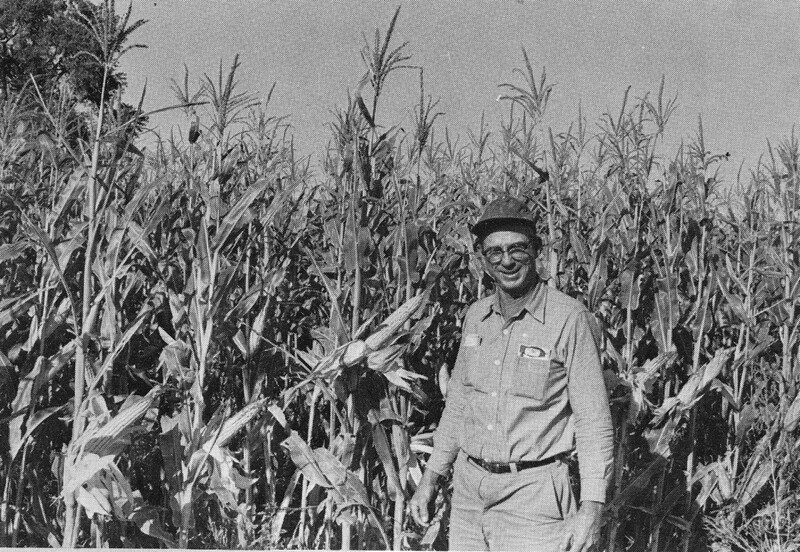 Although a lot of people complained that their sweet corn was ruined by earworms and leaf-feeding insects, Akerlund added, they had no problems and sold corn to customers over a wide area. Extension Agent Novotny reported that farmers short of feed were selling cows for as little as 15 cents a pound. Organic farmers like Livermore, who has a cow herd, didn’t use nitrogen fertilizer, and don’t have to worry about having their cows clean up stalk fields. Livermore has plenty of feed, including an unusually good cutting of alfalfa from a newly-seeded field. A custom operator baling hay in the neighborhood told Livermore he’d be lucky to get 300 bales from his 11-acre field. The final county was 840, showing how well the young alfalfa plants survived the severe drought and how quickly they recovered when the rain finally came. A significant part of the drought story is the high soybean yields reported by the three organic farmers. Livermore’s soybeans, the best he has ever had, made 40 bushels an acre, roughly twice the eastern Nebraska average. “The soybeans were almost shoulder high this fall before the frost and so thick you couldn’t see where the rows were,” he said. Soybeans right across the fence on a chemical farm yielded only 26 bushels per acre. One big difference, Livermore said, was that the pods on his beans were so much closer together than those on the plants in his neighbor’s field. Another problems faced by chemical farmers in drought areas, Akerlund points out, is the fact that their fields have a heavy carryover of herbicides that didn’t get activated during the dry weather. As a result, these farmers are restricted in their cropping plans for next spring and don’t dare plant grass crops in those fields. Although this isn’t the worst drought to hit eastern Nebraska, it is by far the most costly because of the huge outlays farmers make for fertilizer, pesticides, and other chemical inputs. Alan Mulliken, who has farmed 500 acres north of Fremont the last 30 years, said farmers are being hit so hard by the drought this year because they have become too specialized. In the drought years of the 1930s, he recalled, all farmers had livestock and were able to chop up a damaged corn crop in a bad year and feed it to livestock. He might have added that there was no danger of nitrate poisoning then because farmers didn’t apply nitrogen fertilizers. Because of the nature of the organic products applied to the soil by the organic farmers, Akerlund explained, everything put in during a dry year and not used by plants carries over for the following season. Roger Blobaum interviewed and photographed and wrote about organic farmers in the Midwest in the early 1970s. These organic farmer profiles were initially published during that period in Organic Gardening and Farming magazine or in the Organic Observer. Most were published again later in two Rodale Press publications, the Organic Farming Yearbook of Agriculture published in 1975 and Organic Farming: Yesterday’s and Tomorrow’s Agriculture published in 1977. This profile, titled “Beating a Drought, Organically,” also was included as a chapter in Food for People Not for Profit: A Sourcebook on the Food Crisis, edited by Catherine Lerza and Michael Jacobson and published in 1975 by Ballantine Books.